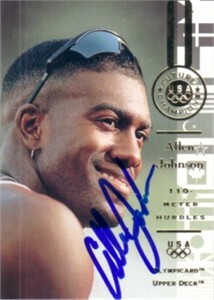 1996 Upper Deck U.S. Olympic card autographed in blue by gold medal winning hurdler Allen Johnson. Obtained in person. With certificate of authenticity from AutographsForSale.com. ONLY ONE LEFT.